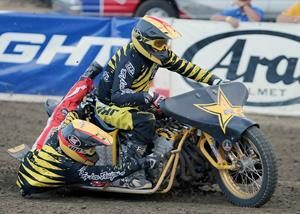 On the eve of the third round of the AMA National Speedway championship series current national champion Billy Janniro was tuning up Friday night at the Fast Fridays Motorcycle Speedway in Auburn. 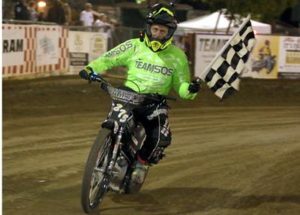 At the Gold Country Fairgrounds Janniro won his eighth scratch main event of the season, again becoming the fastest man of the night taking his familiar place on the winner’s podium with champagne in hand. Janniro and Bart Bast are the only two riders to win the scratch main event at Fast Fridays this season. Bast has three wins. In the night’s finale, Janniro faced a very familiar group. Janniro drew lane three, Bryan Yarrow was in lane one, Bast was in two and Tommy Hedden was on the outside in lane four. All four riders had won their scratch heat races and Janniro and Hedden won their semi-finals to transfer to the scratch main event. Janniro was undefeated in the scratch program. Right out of the gate Janniro got out front inside in turn one with Yarrow on his tail, and Bast following was just behind them. Janniro added some distance on Yarrow and in the second lap Bast made a move passing Yarrow and setting his sights on taking Janniro. Janniro would have none of that and just continued to add more distance on the boys. Janniro took the checkered flag, followed by Bast, Yarrow and then Hedden. 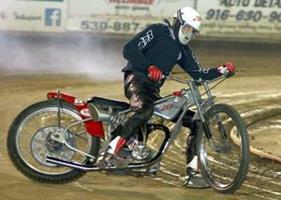 Up from Southern California, Rudy Laurer won big in Division II winning his heat race then the DII main event. A steady rider in Southern California it been a few seasons since Laurer had made the trip north. William McCloskey was second and Shawn Eldredge was third. Casey Cornilsen was back with a win in Division III. Seriously injured earlier in the season but back in great form, Cornilsen kept ahead of Jeff Powell and Dakota VandenBroeder who finished second and third. 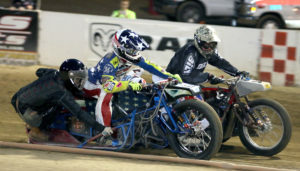 In the fourth round of the SOS Team Challenge Series Rocklin Harley Davidson pulled to within one point of Team SOS. The score coming into Friday night’s round four was 32-25 with Team SOS leading. 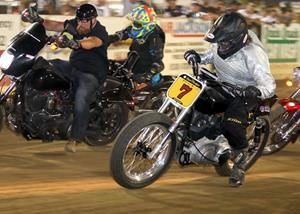 But big efforts from Rocklin Harley Davidson’s Janniro, Venegas and Ryan Bast added nine points followed by points scored by Rick Shafer, Yarrow and Louie Mersaroli brought their round four score to 12 points and a total of 37 points. Team SOS was able to add seven fourth round points to their tally and hang onto the lead by just one point leaving the final series total after four rounds at 38-37. It looks like it is going to be a real close team challenge finish for the last round on August 10 and the championship on September 22. Travis Horn, again making that trip up north from Southern California a regular routine, again captured the Youth 150cc main event. Horn is finding the Fast Friday’s winner’s podium real comfortable this season. 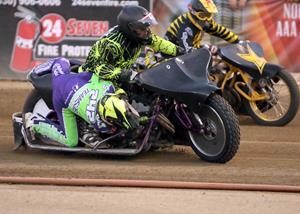 Horn has won four Youth 150cc main events this season at Fast Fridays and two weeks ago won the AMA Speedway Youth 150cc national championship. Colton Nelson was second and Nick Hohlbein was third. 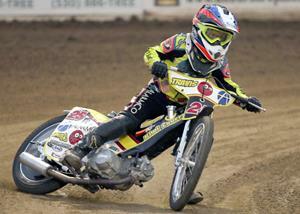 Cameron Krezman celebrated his 15th birthday in a grand way winning the Youth 250cc main event. Krezman was perfect for the night winning both his heat races and the main event. Anthony Dion was second and Landon Norton was third. Coming Friday night Fast Fridays welcomes back those wild three-wheeled jockeys on their 1100cc chariots as the Extreme Sidecars roar into Auburn for their fourth season visit. Their fast paced specialized racing action is not to be missed. With a huge Auburn fan base, the Extreme Sidecars never fail to disappoint, putting on a great show. 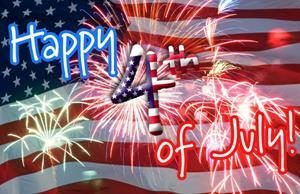 Rocklin Harley Davidson 12 Points-Ryan Bast 3, Charlie Venegas 3, Billy Janniro 3, Bryan Yarrow 1, Louie Mersaroli 1, Rick Shafer 1. 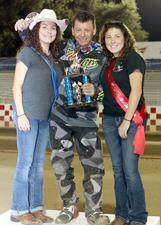 Southern California’s Travis Horn won the Youth 150cc main event.